MV* Patterns : Just a Client-Side Fad or Somthing Useful? As a developer who has used MVC patterns through MVC frameworks for years, it was still such an unsolved question in my mind that what are the main differences between MVVM, MVP and MVC? I was also wondering how and when we prefer one pattern to another. This question was unsolved until I did a job interview at IBM. However I did it well but I couldn't answer one important question. Can you guess what that was about? Yes, It was about differential diagnosis over MVC, MVP, MVVM patterns. In the meantime I was supposed to represent an article for my object oriented programming class in the university. Hence I thought it would be great if I choose an article about MV* patterns, so that it would be such striking two birds with one stone. Consequently I chose an article concerning MV patterns. During the time I was reading the prementioned paper, I had to take a look at the other papers published over MV* patterns. At the end I made the presentation and in spite of that most of the students were sleeping during my presentation, I was sure that in the future they would realize how much this issue is important. I suggest reading this article slowly, step by step and also over and over. In the end I hope you don't sleep while reading this article and enjoy it! MV Patterns : Just a Client-Side Fad or Somthing Useful?! Once a class has been programmed and debugged, it can be handed over to the other programmers being used in their own programs. This called Reusability .You has out-of-the-box Separation of Concerns. In each MV* patterns you have Model and View. They both have their own responsibilities – the model is responsible for encapsulating your domain specific models, on the other hand the view is responsible for showing the model (and eventually handling events, it depends on the framework). This means that your model is not coupled with its representation and eventually can be easily reuse it in different project. It is a loosely coupled development framework as it is divided into three layers. This loose coupling helps in reducing the complexity of the web application, and makes it is easy to maintain and provides better Test Driven Development which was one of the goals of MV* patterns to increase the testability of applications. MV* patterns tend to be modular by nature, which makes it much easier to alter (or even rewrite) one part of the application without it adversely impacting on other areas. They make it very easy to achieve Separation of Concerns that is a key principal to writing code that is easy to maintain and refactor. Flow synchronization is based on sequential command execution: e.g., read user input from text box A, processing it with method B, and write the result to text label C. Flow synchronization uses direct calls between user interface components and domain components. "Essentially each time you do something that changes state that's shared across multiple screens, you tell each screen to update itself. The problem is that this means, in general, that every screen is somewhat coupled to the other the other screens in the application" (By Martin Fowler). For small applications with relatively simple user interfaces, flow synchronization results in clear and easily understandable code. For more complicated programs and more sophisticated user interfaces, the approach can result in code that is difficult to maintain due to the lack of separation of domain and user interface concerns. "Flow Synchronization is an alternative to Observer Synchronization for synchronizing screens with domain data. It is, in many ways a more explicit and straightforward way of doing things. Instead of implicit Observer relationships which can be hard to see and debug, you have explict synchronization calls clearly laid out in the code. The problem with Flow Synchronization is that things can get very messy once you have an unconstrained amount of screens that may share data. Any change on any screen needs to trigger other screens to update. Doing this through explicit calls to other screens makes screens very interdependent. This is where Observer Synchronization is so much easier" (By Martin Fowler). In the below example you can see how a Flow Synchronization method works. Based on Martin Fowler one of the well-known code styles for implementing Flow synchronization is having a root window which is open for the whole application (It is the main window of the application). Each time you want to open a part of application features a child window will be opened. After changing any data in child, the root window will be updated on closing the child window. 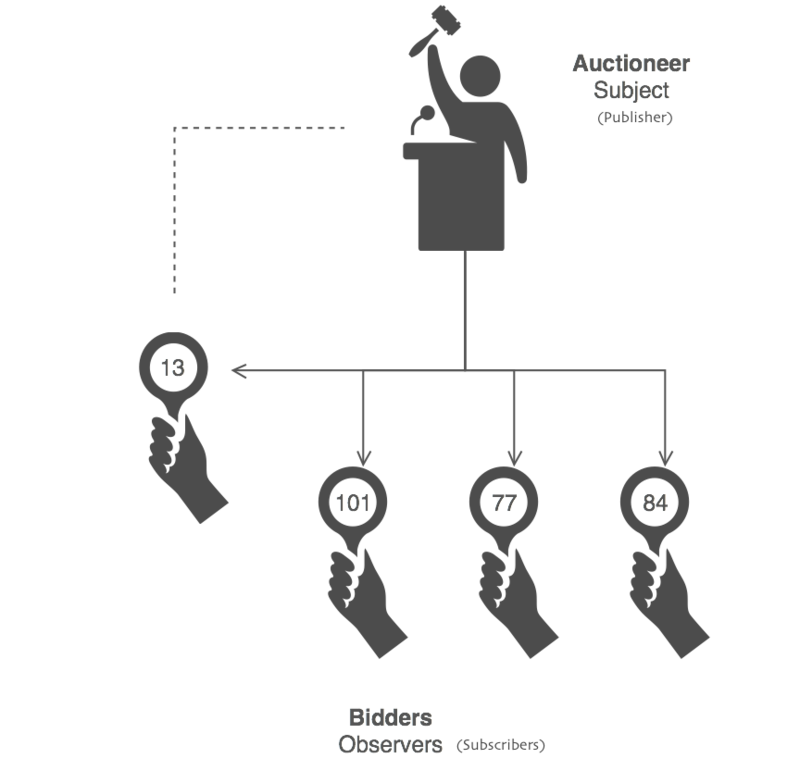 Unlike Flow Synchronization which is based on direct and sequential calls, Observer Synchronization is found on the Publisher-Subscriber style where there is a central publisher who publishs an event and there are a set of subscribers who subscribe the events and start listening the publisher. As soon as publisher raised an event all the presubscribed members get notified. In this method the publisher is not aware of the subscribers and their internal structure, hence we have a good seperation of concerns. Also in this way the encapsulation principles are met. provides an interface for attaching and detaching Observer objects. defines an updating interface for objects that should be notified of changes in a subject. First the publisher class was created and the subscribers field was added to the prototype ofpublisher object. In the next step we will write the subscribing code where the observers can subscribe the publisher. Interesting, isn't it? Yep!! Now we can do the same for all the objects as we did for Array or Function objects. We can modify the built-in functions as well (but this is out of the scope of this topic). As you can see, I have used the some function. some is a boolean function who tests whether some of the array members can pass the test implemented by callback function or not and returns True or False. In the above line you can see that the some function has used to see whether the subscriber already exist or not. Obviously when it comes to conclusion that it doesn't exist, the subscriber will be added into the subscribersarray of publisher class. As observers can subscribe, they ought to have the ability to unsubscribe as well. The filter method filters the array's members rely on the callback functionality. Then in this method thefilter method returns all the members except the one who is the object itself. The last function called deliver that is responsible to deliver the events to the event listeners (Observers). This function uses the forEach method of Array object. The forEach() method executes a provided function once per array element. As you may have realized I have used Method Chaining in this class. Chaining Methods also known as Cascading, refers to repeatedly calling one method after another on an object, in one continuous line of code. It allows us to read code like a sentence, flowing gracefully across the page. It also frees us from the monotonous, blocky structures we usually construct. Now that you know some important basics, you are ready to take a travel to the land of MV* pattern. Then pack your baggage and be ready to go. Forms and Controls (also known as Widget-based User Interface) is the concept of Visual Programming as we had in Visual Basic and the other Visual Programming languages, where the programmer adds a bunch of controls to the form and then simply starts handling all the domain logics in the class related to the designed form. In this approach the form class is responsible for handling everything related to the domain area such as the business logic, user interface, event handling and handling data model. Widget-Based approach is too simple and it is totally adequate for small applications. If we are expected to create a simple application for a university task and we know it won't extend, why we need something more?! Simplicity: widget-based user interfaces are very simple to understand: the widgets on the form become fields of a Form class, so the developer can access the widgets just as any other field. Consistency: the approach employs flow synchronization. Synchronization is handled explicitly: target views/widgets are modified by direct calls, so the code is easy to understand. Efficiency: creating a sophisticated multi-tier architecture for applications that do not require rich user interfaces would be overkill. Keeping the design simple in such cases reduces development time and increases maintainability. Welcome to the land of MV* patterns. In this land you will learn about MVC, MVVM and MVP , their structure and their difference. Also you will learn about each one's pros and cons. All the Patterns in this area have two shared parts: View and Model. However Model and View are shared between all but the responsibility and the scope of authority of each pattern varies. On the other hand each patterns has a third part e called it " * " that means this part is different for each pattern. The "*" can be either Model-View in MVVM, or Controller in MVC, or Presenter in MVP. The other issue that may vary based on each pattern is the type of Synchronization Approach we talked earlier. The above figure shows three arrows labeled with question sign "?". Also as you can see, the third part is responsible for connecting View and Model. When we are talking about the way two components talking to each other, actually we are talking about the different Synchronization approaches. The rest of this article is dedicated to survey how the variation in the third part ("*") and also the relationship between each layer ("?") can affect the way we deal with each pattern. MVC was invented at Xerox Parc in the 70's and first time its basics were published on a paper named "A Cookbook for Using the Model-View-Controller User Interface Paradigm in Smalltalk -80", by Glenn Krasner and Stephen Pope, published in the August/September 1988. SmallTalk 80's MVC even came earlier that "Forms and Controls" approach. Initially, MVC was used for designing and building desktop applications with rich graphical user interfaces. Over time, the original MVC pattern evolved and variants emerged driven by technological evolutions and new needs. Nowadays, MVC is used for integrating interface logic with domain logic in development of various domains, such as Web applications and mobile systems. As we said the collaboration between each layer in each of MV* patterns is different. 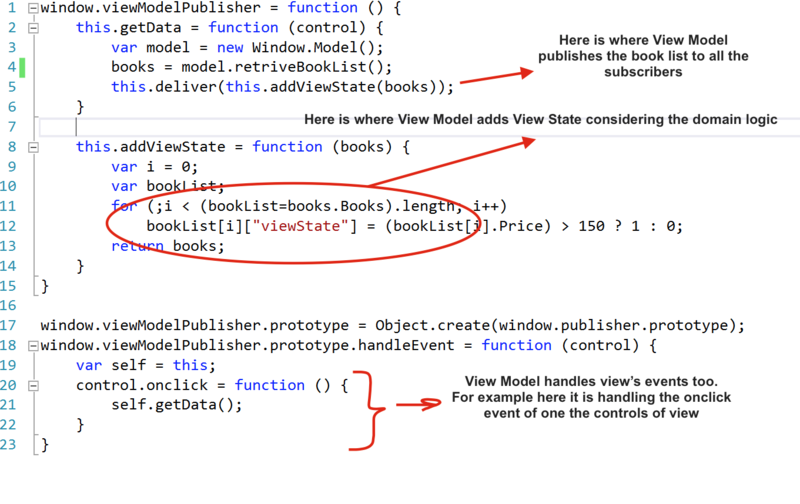 In MVC Colntroller is such a dealer between View and Model for all the requests goes from View to Model. See the diagram. In this diagram you can see that both View and Controller are observing the Model. It means MVC uses Observer Synchronization. View and Controller work as a pair allowing the user to interact with the user interface. For example, the user interface may provide a text box allowing the user to enter a user name. The View is responsible for rendering the text box. The user can change the text and press keys (e.g., the Enter key) – such events are handled by the Controller. The Model maintains the domain data. Often, the application has one Model and a set of View-Controller pairs working with it. But there is something confusing here. First time when I started implementing this pattern, It was completely confusing. I sent an email to some of the guys who had written some papers about MVC and asked them about the rule that Controller plays in this diagram. Unfortunately they were also confused and couldn't give me a clear answer. So, what was that confusing issue about? 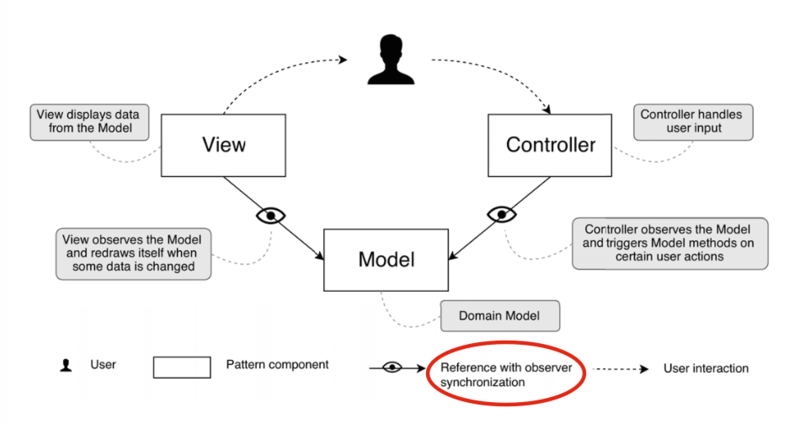 It is normal for View to observe the Model ( since it needs to get model data as soon as Model publishes) but why Controller observes the Model? Why we need it? As we said Controller is just responsible for handling the user inputs and events. To know this, lets talk about the Model in MVC. Model in MVC, as already mentioned undertakes the Domain Data and Domain Logic parts. This behavior has considered as one of the disadvantages of MVC because it doesn't follow the separation of concerns. Imagine we have a textbox in View and View sends a request through Controller to Model getting some data related to the textbox. Lets suppose this textbox contains the age and we want to change the color of textbox's value to red if the age is more than 80. Who is responsible for this? The text color is purely a user interface property and therefore should not be part of the model. In SmallTalk80's MVC, Model is responsible to do this and it isn't right. Smalltalk developers found ways to handle such cases, e.g., by developing custom Views that implement the required logic. However, these solutions did not solve the underlying problem. In one of the articles I read this sentence : "Smalltalk’80 MVC provides a good solution for displaying the model data itself; however, it provides no explicit means to deal with the presentation of state that is not part of the model but that makes a user interface more convenient for usage". Let's return to our BIG question, "why Controller observes Model"? If Controller observes Model, then Controller will be notified of every changes of Model ( while View is being updated too). So, Controller can observe the Data which is getting prepared to View. Therefore Controller can take part in a part of domain's logic. So we won't have the previous problem anymore because Controller can check the age now. On the other hand View connects to Controller through the direct calls. Thus Controller can read the age each time, set one of its properties as View State (The state of TextBox color), so that View is able to get access to the Controller's property through a direct call and set its color based on the View State. As a consequence we can allocate a part of domain logic to Controller and free Model of doing the thing was not its responsibility. Now we can Strike the following sentence since it was not right :"it provides no explicit means to deal with the presentation of state that is not part of the model but that makes a user interface more convenient for usage". As you can see Model get inherited from Observer Synchronizer class. The getData method is the one will be called by Controller. This method can be very simple like the below sample, or it can use some Ajax calls to get some information from DataBase. Lets take a look at View. As I said View is responsible for just view elements such as html forms, controls , css styles and son on. View creates a List of books based on the view state and will add a color to the respective text. Also View observes Model to get notified when any event raised by Model. In 2005 John Gossman unveiled Model-View-View Model pattern in his blog. He is one of Microsoft's WPF and Silverlight architectures and by the way MVVM has used on Silverlight and WPF and it was totally successful. 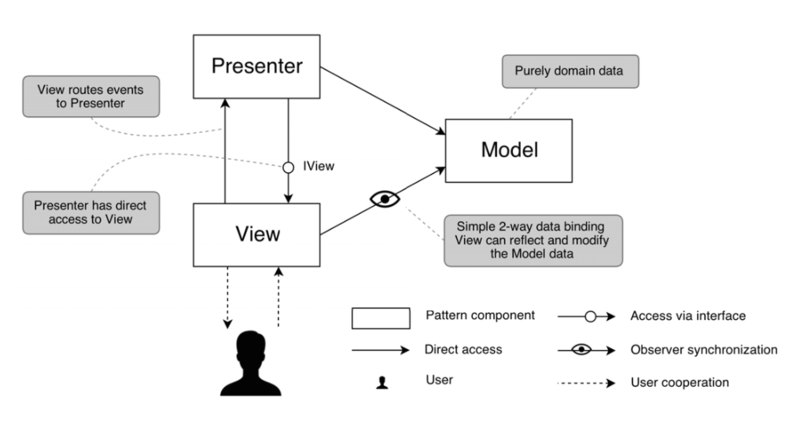 MVVM is identical to Fowler's Presentation Model, in that both patterns feature an abstraction of a View, which contains a View's state and behavior. Fowler introduced Presentation Model as a means of creating a UI platform-independent abstraction of a View, whereas Gossman introduced MVVM as a standardized way to leverage core features of WPF to simplify the creation of user interfaces. As you read before, I encountered a big confusion in MVC about the controller and it's scope of authority. When I wanted talking about MVVM in this article, i thought it was better read more resources and suddenly I saw this : "In Martin Fowler’s “GUI Architectures” document (bit.ly/11OH7Y), he states the following about MVC: “Different people reading about MVC in different places take different ideas from it and describe these as ‘MVC.’ If this doesn’t cause enough confusion, you then get the effect of misunderstandings of MVC that develop through a system of Chinese whispers.” The “Whatsa Controller Anyway” document at bit.ly/7ajVeS sums up his point nicely stating: “Computer scientists in general have an annoying tendency to overload terms. That is to say, they tend to assign more than one meaning (sometimes contradictory) to the same word.”"
In Smalltalk MVC, “every” View will have a Controller and only one Controller at any given time can be active! This can be sometimes considered as a big lack. Imagine you want to have several View for each Controller. MVC itself doesn't prepare this ability and for implementing this, probably we need using some programming techniques and tricks. These lacks and confusions caused emerging new architectures such as MVVM. The next sections will talk about the MVVM in detail. In the first glimpse the most important thing has changed in MVVM is the way View and Model communicate together. The second one is the third part called "ModelView". The pattern has a linear structure. The View is responsible for rendering the user interface; it can observe the View Model, trigger its methods an modify its properties when needed. View maintains a one-way reference to the View Model. 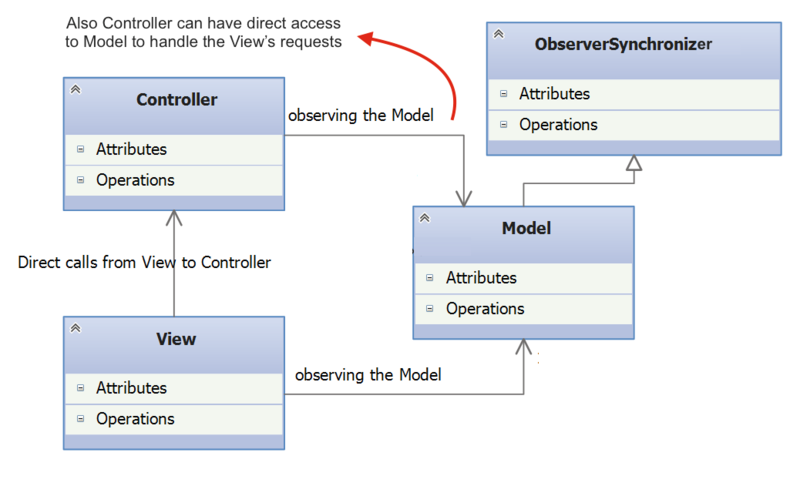 When a View Model property is changed, View is notified by observer synchronization. On the other hand, when a user interacts with the View, View Model properties are directly modified. 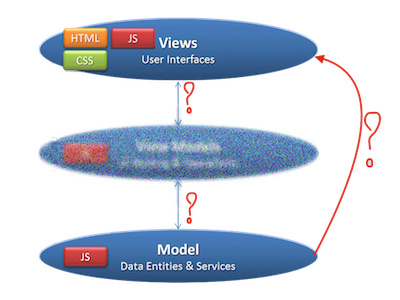 View-Model is responsible for handling view state and user interaction; it has access to the domain Model, so it could work with domain data and invoke business logic. View-Model is unaware of View. Model is responsible for handling domain data and is unaware of View Model. This approach allows creation of several different views for the same data, and observer synchronization makes these views work simultaneously. In this pattern each "View-Model" can have several Views. Guess why? Yes, since several Views observe an individual View Model. "View-Model" has direct access to Model. It calls Model's methods and returns results through events! When an event raised all the Views get notified and update themselves. 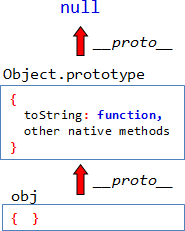 As you can see, "View- Model" is like a wrapper and prevents direct communication between View and Model. "View-Model" is responsible for the domain logic. As it was mentioned, View also can have a direct calls to "View-Model" in order to requesting data from Model through "View-Model". As before "View-Model" is responsible for handling the View's events as well. For example when a button clicked, the respective event handlers in View-Model is called and some commands are executed in "View-Model". View Model has direct access to Model and Model has no idea about View Model and View. Then View Model calls one of the methods of Model who retrieves data and the rest of things will be done by View Model. On the other hand View Model is a publisher. It gets data, checks them and set View State based on the domain logic and sends the result to View through an Observer Synchronization. View on the other hand is responsible for interface elements. It observes the View Model ang get notified as soon as View Model publishes books list. This is where we see one of the power points on MVVM. Now several Views can observe View Model and generate interface elements considering their own style. For example imagine we want to show the recieved data in several charts such as linear chart , Area chart and Bar chart. Now each view can geberate its own chart based on the same data. As you see MVVM is such a very powerful pattern for handling separation of concerns however it seems one of its weak points is over using the observer synchronization that may cost performance .In the next section we will see another pattern which won't have performance issues. Welcome to the last part of this article. "The Model-View-Presenter software pattern originated in the early 1990s at Taligent, a joint venture of Apple, HP, and IBM, and was the underlying programming model for application development in Taligent's C++-based CommonPoint environment"(Wikipedia). After Taligent's demise in 1997Dolphin Smalltalk adapted the MVP pattern to form the basis for their Smalltalk user interface framework. MVP has composed of three parts. 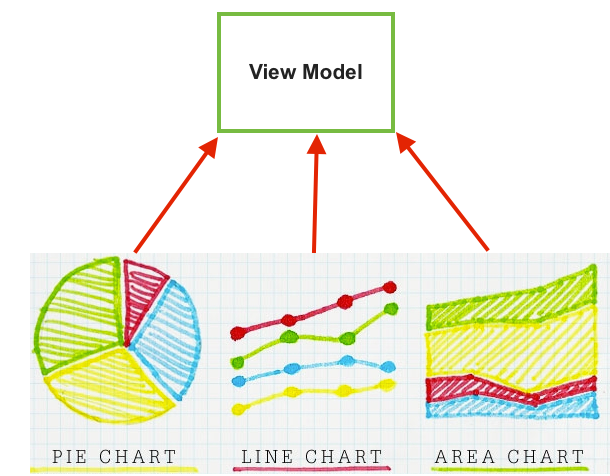 View, just like MVC is responsible for showing the Model's data. In one of the papers it's said that View in MVP is almost unchanged however based on Dolphine Smalltalk paper unlike MVC, here, View is responsible for handling some events such as onclick : "One significant difference in MVP is the removal of the controller. Instead, the view is expected to handle the raw user interface events generated by the operating system (in Windows these come in as WM_xxxx messages) and this way of working fits more naturally into the style of most modern operating systems." Consequently first time I did a mistake and coded the event handling part on Presenter while based on the aforementioned paper View is responsible for event handling. Here the Presenter guarantees to affirm the domain logic. Moreover Presenter is in charge of how View can manipulate the Model data or send a request to Model. Here is where we can see the heart of MVP that makes a significant difference with the other MV* patterns. I will talk about this in the next section. Here the Model plays the Publisher rule for some viewers who play the observer rule. Furthermore Model is unaware of Presenter and View. In MVP, the Model is a purely domain object and unlike Model in MVC, it cannot manipulate the View. View observes the Model and Model notifies View. There is a two-way connection between View and Presenter. This is where that heart of MVP appears where Presenter has direct access to View. It means View get data from Model and Presenter impose the domain logic spontaneously. View triggers the Presenter to perform domain logic. The Presenter performs the domain logic and commands the View to update its View State. The great flexibility of the Dolphin Smalltalk MVP pattern comes from the decision that the Presenter can directly access the View. This can be considered as one of the power points of presenter, but this kind of empowering the Presenter can easily lead complexity. 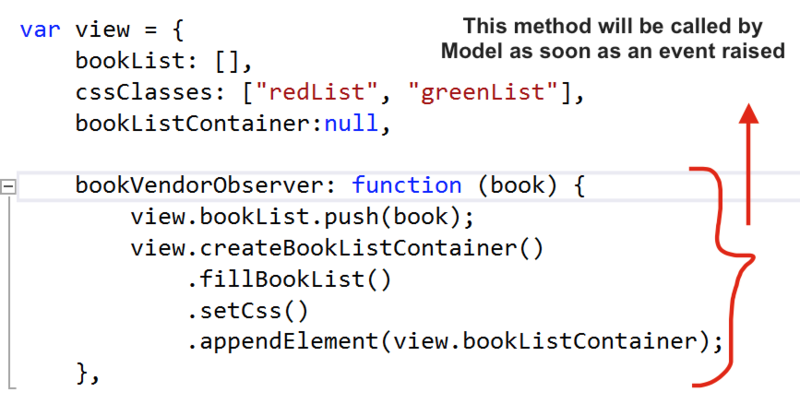 In this section the Model has the same code as I wrote in MVC. Then let's focus on Presenter and View where the key differences come from. View in MVP is almost same as the View in MVC with this key difference that View in MVP is also responsible for handling the Controller events such as onclick. And here View trigger the presenter to perform domain logic. As a result Presenter will perform the doman logic and with a direct access calls the setCss()method of View. Additionally Presenter can call Model's respective methods based on the issued request from View. As I said I avoided putting the whole code here, then take a look at the code attached in this article to know the code in detail. However I prsented the Dolphine Smalltalk MVP, but talking about the MVP (Passive View) is totally necessary since nowadays when we are talking about MVP we mostly mean Passive View Pattern. In the next updates I will expatiate it. I am a PhD candidate in computer science. I started software development since 2006 and it seems like now it consumes most every part of my life. My life is my computer and solving problems, more specifically computational-mathematical problems, is my passion.I mostly enjoy areas like Machine Learning, Big Data and Brain-Computer Interface (BCI). My major goal in my life is becoming a person who utilizes everything he knows to improve human life quality. I also like hiking and reading self-development books. Simply brilliant. A valuable trick in bloody well written and laid out article. What is a MVC ? Think the biggest problem is you don't define your abbreviations at the start MVC etc. Many readers will know but many won't or they will need a quick reminder! Think there might be some light at the end of the tunnel, the logical thing we need is small, simple and independent libaries that we can just choose as required - sounds familar it's the way it was! Re: What is a MVC ? So you think it is better giving an abbreviation about MVC and other patterns. The thing I couldn't understand was that I've written a complete introduction about each pattern. So, I'd appreciate you if you tell me what you meant. Yep, this article has somehow an academic sense since at first it was an academic research. MVC, MVP, MVVM abbreviations stand for. Yes you can work it out but the reader shouldn't have to! Unfortunately its a mistake that is too often assumed by the technical writer that the abbreviations/acronyms are known to the reader,even experts can't always remember! The other good reason for doing so is that it may well help in getting hits by search engines! This article will attract the attention of especially novice programmers new to the world of MV*. I would however suggest a a language-centric-rework of the article to improve readability. I wrote this article while I was in hurry. Can I ask you to tell me which parts had problem. Can you give me few examples? This article makes a number of good points, including the observation that the term "MVC" means widely different things to different people. However, it is marred by poor English style. It could use major editing by a native English speaker. It would be better anda elegant use an OOP. I may implement them with c# and Java too but it needs a little free time. I am trying to understand MVP and MVVM since some time ago. Until now I have many doubts and I thought your article will finally help me. Let me know when the Java or C# version of this article is going to be published. It seems that you are still confused about the principles of the MVC paradigm. You claim that it's a disadvantage to combine the responsibilites of "Domain Data and Domain Logic" in the model part of the app. This funny claim ignores the fact that this is the most fundamental architectural principle of the MVC paradigm. Clearly, both "Domain Data" and "Domain Logic" are closely related, they are not different concerns that have to be separated! Also, your way of implementing classes in JS is quite strange and must be totally confusing for any beginner. You are confusing upper with lower case, superfluously writing "windows. ", mistakenly defining the "subscribers" property as a prototype property and generously extending built-in objects like "Function" without a real need. 1: I didn't claim that this is a disadvantage of MVC! The academic papers and Smalltalk's developers were the ones who claimed it! I just quote it. They exactly claimed that : this disadvantage of MVC caused them to implement custom views for MVC. Probably you know the meaning of research! In an academic research we never claim something without any reference and we never come to a conclusion without testing and we never publish the results without consulting the writers of the previous fundamental papers! If you read the foreword and some of the patterns in this book, you will understand why we used this kind of implementation. 3: Based on your comment I came to this amazing conclusion that You called the result of at least 2 books and 3 academic well-known papers superficial! 4: It seems there is no middle way in your mind. Have you ever read the rating guide of codeproject? Do you know the meaning of "my vote of 1"?! I don't think so. 6: You never read this article's foreword and conclusion parts since I mentioned that however this article is based on reading several articles and also my talks to the writers, but it is not fault free and probably there exist a bunch of issues may have objecting and this is why we are here. We are here to analyze, debate and come to an acceptable conclusion not to condemn and free our frustrated energies! I liked the general overview of the patterns and example explanations. However, I think this article can benefit greatly from a peer review (grammar, content, accuracy). English is not my first language either, but almost all sentences have errors which makes reading the article a real challenge. Thank you for taking the time to compile this article. Mario, thanks for your response. Can you tell me which parts had grammatical mistake? I have reviewed. It has some spelling problems that I will correct them but there is no grammatical mistake that make it not understandable. I will be happy to give me more feedback to improve it. "As I you read I encountered a big confusion in MVC about the controller and it's scope of authority." -> ? and many many others. Maybe you can copy and paste the article into Microsoft Word or a similar word processor and correct the mistakes there. Yes. Exactly. As I told you, it was more about misspelling. It is because of writing this article very quickly. I appreciate your consideration. I will improve it. I corrected the misspelled words. I will try to make some changes in its literature for making it much easier to understand. I found another possible grammatical correction: You has out-of-the-box Separation of Concerns. It could be You have out-of-the-box Separation of Concerns. I am prepared to carry out preliminary proof-reading if you like.